Iron ore is a sedimentary rock that was formed by deposition on ancient seabeds. The “Mesozoic” ores that were quarried in this area were formed in the Jurassic age when the majority of the current land mass was covered in shallow seas. Sediments were deposited on the seabed over a long period of time and often in a very uneven way. Over hundreds of thousands of years, the seas changed in nature, as did the deposition. Eventually, as the seas over Britain receded, and millions of years passed by, these deposits formed three distinct types of ore.
A large area around Scunthorpe produced “Frodingham Ironstone” from the lower lias but this ore did not extend south beyond Lincoln. In our area two distinct types of ironstone were actively worked. One was the “Marlstone” bed in the middle lias, the ore being warm red in colour and often appearing as “outcrops” at Caythorpe, Woolsthorpe and the Oxfordshire Ironstone system near Banbury. The other was the “Northampton Sand” from the upper lias, which was the principal worked ore in this area, often associated with the overlying deposit known as Lincolnshire Limestone and together forming the geological feature known as Lincoln Edge on which stand Lincoln Cathedral and Rockingham Castle. Although outcropping in the escarpment, the strata, which varied between 10 and 30 feet in thickness, lies on a falling gradient and as a consequence the “overburden” cover increases the further away it is quarried. In Roman times there was much iron making in the area as outcrops of rock were exploited for smelting. Although generally unknown, medieval ore extraction continued for many centuries and only reached its peak in the 17th Century evidenced by the building of Rockingham Castle to protect the Royal forges. Unfortunately, the industry foundered when higher-grade imports from Sweden were introduced, a story that would reoccur again in modern times! 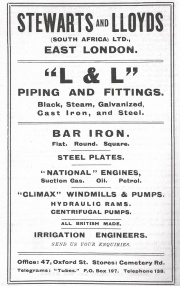 During the early years of the industrial revolution, the ores of the East Midlands were virtually forgotten as ironworks sprang up in coal producing areas many of which also had iron ore in close association. It was only when these sources began to be worked out that the potential of the rapidly developing railway system became apparent. Samples of ores were shown at the Great Exhibition of 1851 these inspiring new ironworks in the Wellingborough area close to the source of the iron ore. Most home produced ores at this time contained too much phosphorus for steel production and imports were still required. In 1879 however, the Gilchrist Thomas patented method allowed home ore to be used thus allowing the extensive East Midlands ore fields to be developed. In Rutland the opening of the two-mile Midland Railway Ashwell to Cottesmore mineral branch in 1882 from the Oakham to Stamford railway was inspired by iron ore workings that had started in 1872 at the top of the escarpment. A three-foot gauge tramway rail transport system and a rope incline allowed fully loaded wagons to be let down the steep slope of the eastern edge of the vale of Catmose to tip the iron ore into the mainline rail wagons for onward transport to the steelworks. At this time the methods were considered to be “cutting edge” often replacing archaic horse & cart haulage over inferior roads, as was the case here. To exploit the ore fields further from its outcrop, increasingly heavier machinery and greater investment was required to remove increasing overburden. By the time that the Burley Quarries (which also connected to the Cottesmore Branch) were developed by the Dorman Long Companies to cope with increased demand in the First World War, standard gauge railways and mechanical steam diggers were employed. Again, because of increased demand after the Second World War, huge capital investment was required to exploit the last quarry system connected to the Cottesmore Branch, the United Steel Companies Exton Park system. Here, overburden of around 60 feet in depth required huge electrically driven quarry draglines such as the famous “Sundew” a W1400 Ransomes & Rapier dragline to be built. In our area, these increasing depths led both United Steel Companies and Stewarts & Lloyds Ltd to develop underground mining as an alternative in the late 1950’s. Mines at Easton and Thistleton were opened up but ultimately failed due to inconsistency of the strata level, a problem that it was possible to cope with under opencast conditions. Other iron ore quarries in Rutland included Pilton, Luffenham, Market Overton and Uppingham. Many quarries to the south, (Cranford, Storefield, Corby & Glendon), north into Lincolnshire, (Buckminster, Colsterworth and Harlaxton) and Leicestershire (Woolsthorpe) were long lasting and the Museum has gathered exhibits and artefacts from most of these systems. Although a primary raw material, the home production of iron ore has always been closely linked to national economic and political influences. There have always been imports of ores but through wartime or periods of high economic activity the home industry has flourished. The reverse has also been true. The collection now evidences the huge investment by the Oxfordshire Ironstone Company to modernise its locomotive fleet in 1965 through the acquisition of a whole fleet of Rolls-Royce Sentinel diesels only for the economy to force the closure of the whole system only two years later. In latter years, under economic pressure, most of the smaller ironworks in the East Midlands were closed despite their longevity and eventually under Nationalisation, the steelworks at Scunthorpe and Corby were effectively the only consumers of the bulk of home production. Even these consumers were forced to consider the economic viability of home production of low-grade ore against the importation of higher-grade foreign ores. When Scunthorpe converted to a new process, which relied on the higher-grade ores, it left Corby as the sole consumer. The last load of home produced ore was despatched to Corby steelworks on the 4th January 1980 bringing a once proud industry to a close, not that the mineral resources themselves have been fully worked out. Small-scale extraction for building stone has continued sporadically in certain areas. The continued development of mineral extraction techniques have now also rendered railway transport obsolete in quarries. The last standard gauge quarry railway system in Britain, at Barrington Cement Works in Cambridgeshire, was closed in 2005. Our Museum is pleased to preserve and continue to operate a range of their equipment for posterity. One could be forgiven for expecting that opencast quarrying would have left its indelible mark on the landscape. However it is a tribute to the past and more importantly present restoration techniques of such quarries that today it is now often difficult to identify major areas of quarried ground. Whilst some vestiges of past activity remain, these can easily be missed by the untrained eye. Some are as subtle as the changes in hedgerow planting or field layouts but equally there are also some very visible and obvious features such as “sunken fields” once you know where to look. This is very much an untold story for the young, new residents and visitors to the area and one that we hope you will find as interesting as we do. While archive film and photographs exist, our Charity has gone further by preserving and demonstrating the original machinery in an authentic way on a historic site to provide the visitor with a range of experiences, which are otherwise impossible to witness.